We are known for our Mokume Gane jewellery designs. Mokume Gane is a rare and complex technique that creates wonderful fusions of Gold, Palladium and Platinum in flowing and natural forms. This adds an additional layer of richness and distinctiveness to our hand made jewellery, making it very special indeed. Mokume Gane is a 17th Century Japanese technique (translated as ‘Wood-Metal’) by which layers of Gold, Platinum, Palladium and Silver are fused together and then forged. This artistic metalwork practice creates inimitable patterns in each single fusion. Every piece of Thyssen Mokume Gane Jewellery has its own DNA. We have carefully developed the process, adapting the precious metal mix and varying forging methods, to create a wonderful array of combinations. These range from high-contrast bold and dramatic manifestations to more subtle, delicate and understated forms. We are continually innovating and trialling new fusions. 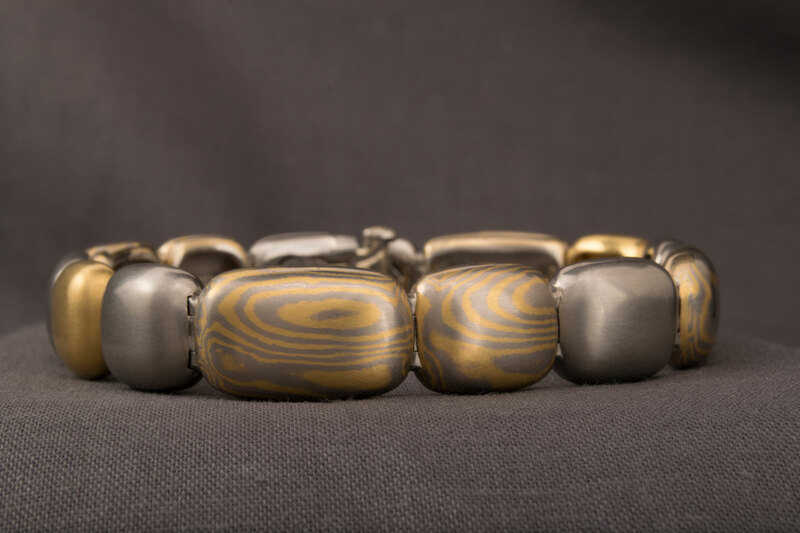 Mokume Gane metal is striking as both an accent and as a complete piece of jewellery. See our Mokume Gane Gallery for inspiration. It is particularly remarkable when used for Engagement Rings and in our signature Mokume Gane Wedding Rings. The colour, character and detail of Mokume Gane is best experienced in person and we welcome visits to our shop to see this beautiful artistry first-hand. Please book an appointment so we have time to sit down and discuss your commission. We accept commissions from all over the world. Through our Design Consultation Service we can design you a unique piece, find out more.